A fantastic season for Belarus continued with victory in the 2018 Kremlin Cup for Anastasiya Prokopenko and Ilya Palazkov in Moscow, Russia on September 23. Prokopenko, the new women’s individual world champion and world No.1, and Palazkov (world No.5) entered the competition as the top-ranked athletes but they only prevailed after a dramatic race. The Kremlin Cup is a single-day Mixed Relay event and there were 11 nations in attendance this year, with Hungary, France, Germany, Lithuania, Korea, Egypt, Italy, Poland and Kazakhstan lining up against Belarus and the host nation Russia. 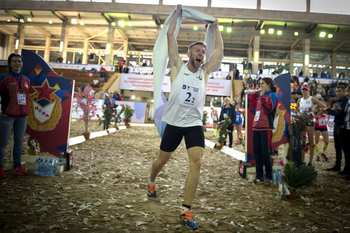 A breathtaking finish saw Palazkov (BLR) come from behind in the last 800 metres of the Laser Run to secure victory by 14sec and claim the first prize of $USD20,000 shared with Prokopenko (BLR). 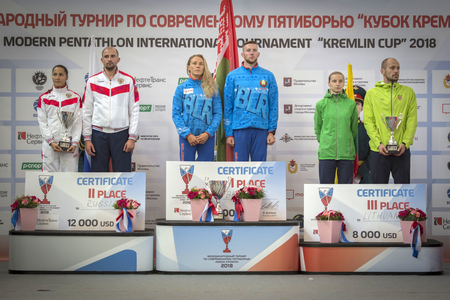 The Russian team, consisting of 2016 Olympic champion Alexander Lesun and 2017 world champion Gulnaz Gubaydullina, picked up 2nd place and Lithuania (Gintare Venckauskaite / Justinas Kinderis) finished 3rd. In a high-quality field packed with an international class, France (Elodie Clouvel / Valentin Belaud) missed out on the podium in 4th place, finishing just ahead of 5th-placed Kazakhstan (Elena Potapenko / Vladislav Sukharev) and 6th-placed Hungary (Sarolta Kovacs / Bence Demeter). Russia (Gubaydullina/Lesun) took the lead with a time of 1:56.22 for a score of 318, five more than Hungary (Kovacs/Demeter). France (Clouvel/Belaud) incurred a 10-point penalty that pushed them back to 8th place. Belarus (Prokopenko/Palazkov) topped the standings on the piste after Prokopenko scored a superb 19V/3D for a total of 252 points, enabling them to move within seven points of the overall leaders Russia (Gubaydullina/Lesun). Russia (Gubaydullina/Lesun) achieved a perfect score of 300 points after a clear round in the Riding arena and this enabled them to extend their overall lead to 21sec ahead of the Laser Run. Prokopenko (BLR) ran wonderfully well but the excellent shooting of Gubaydullina (RUS) kept the hosts in 1st position with a narrow advantage. When Lesun (RUS) took over from his partner the home team enjoyed a 16sec lead, but an excellent Laser Run by Palazkov (BLR) decided the final outcome.